Taking on a side hustle is a great way to get out of debt fast. It allows you to make more money so that you can put that extra income on debt to pay it off faster. Here are some ways to make money from home to become debt-free faster. It’s possible to get out of debt faster with a side hustle working from home. If you’re trying to pay off debt but you can barely afford to pay the minimum amounts, one way to pay more than the minimum payments is to increase your income. There are many ways to increase your income. One way is by having a side hustle. Whether you work full time, you’re a stay-at-home parent, student or someone who’s looking to earn some extra money, starting a side hustle is a great way to earn that extra csh. You can use that extra cash to become debt-free quickly. A side hustle is basically a freelance job or gig that you do in your spare time to bring in some extra income. It’s also called a side gig, side ob, second job, etc. 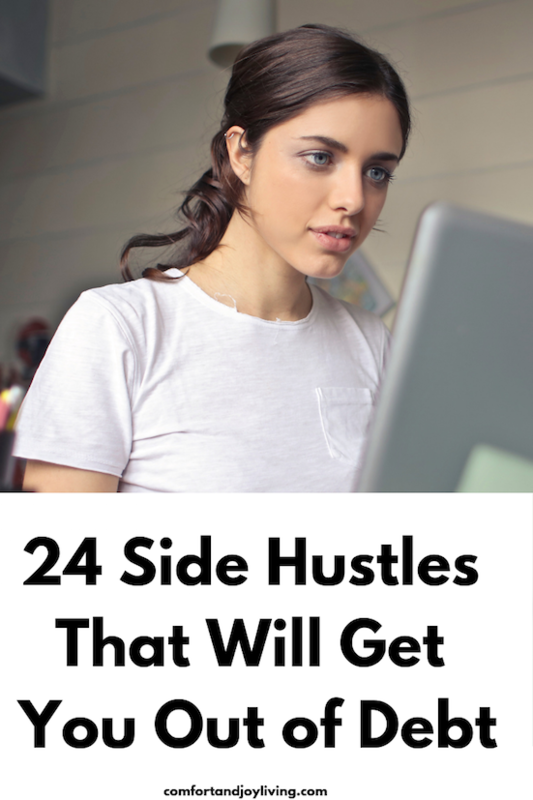 There are a lot of different side hustles out there that you can do to make extra money. Traditional side hustles may include cleaning, babysitting, delivering pizza, etc. And then there are online side hustles that you can do online from home or anywhere if you have a computer or smartphone with access to the Internet. Online side hustles include online freelancing, online tutoring, virtual assisting, selling things online, etc. There are many ways to et out of debt fast with a side hustle. There are a lot of side hustles out there, but you’ll want to fine one that you are good at and passionate about. Do you have a hobby that you can turn into cash? Can you provide a service that companies and people would pay for? Can you think of a product that you can provide and that people would pay for? You will want to start a side hustle that brings you joy and makes you money. If you have an outgoing personality, you might want to take on an out-of-home side hustle to bring you some additional income. If you want to work from the comfort of your home, start a work from home side hustle or online side hustle. Here are some great ways to get out of debt fast with a side hustle to help you earn extra money that you an put towards your debt to become debt-free quickly. If you are detail-oriented, and have excellent grammar, spelling and punctuation skills, then you can do proofreading for clients online. Many authors, researchers, bloggers and companies need proofreaders to proofread their writing. You will make sure that there are no spelling, grammatical and typographical errors or mistakes. You can join sign up with some proofreading agencies or companies online such as ProofreadingServices, Polished Paper, Kibin, Domainite and HelloEssay to find work. In addition, you can register on freelance sites like Freelancer, Upwork, PeoplePerHour to find proofreading jobs online. One of the easiest ways to start a side hustle is to take online surveys. You don’t need any special skills to earn extra money from quick online surveys. They won’t make you rich, but if you’re able to complete a few surveys a day, depending on your schedule, it’s possible to bring in a couple to several hundred dollars a month. Some of the reputable sites that will pay you money to complete surveys include Pinecone Research, Swagbucks, InboxDollars, Opinion Surveys, Surveys Paid, Survey Downline, Survey Club, Cash Surveys Only, Amp Surveys, and Survey Momma. If you know how to optimize a website or blog for search engines, you can earn money as an SEO consultant. You’ll help companies and people get their websites and blogs found easily by their potential customers or target visitors. As an SEO expert, you’ll help a website rank high in search engines’ results pages, preferably on the first page of SERPs. You’ll need to know about on page SEO and off page SEO, what SEO tools to use, how to research keywords, the difference between good links vs. bad links, and so on. If you’re knowledgeable about search engines and SEO best practices, you can make money by offering SEO consulting services to businesses and people or their websites and blogs.Check out freelance sites like Freelancer, Upwork, PeoplePerHour, and Guru to find SEO jobs and offer your SEO services on Fiverr and SEOClerks. Go on Internet marketing forum sites to offer your services or approach local businesses. People are busier and busier these days. We pack a lot into our schedules, leaving us with less time to take care of certain responsibilities. You can use this to your advantage by running errands for money for busy people. Check out TaskRabbit for local opportunities. Can you bake? You can sell your delicious creations for parties, weddings or even restaurants in your area. Read this post on “How to Start a Home-Based Baking Business” to learn more. Do you love to cook? Are you the go-to person to cook for family events and holidays? You can offer your services as a caterer on the weekends. Start with small dinner parties as you get comfortable with this side hustle. A home cleaning business can be quite profitable with minimal startup requirements. There’s a definite need for home cleaning services. Dual-income households typically don’t have much spare time to clean, so homeowners may be glad to hear about your cleaning service. A babysitting side hustle is a great option to earn extra money if you’re a mom and have experience looking after children. You’ll work from home looking after other people’s children while also spending time with your own family. You can find clients yourself in your area or join a babysitting network. There are also online platforms such as Sitter City and Care.com that connect parents and babysitters. You can also find babysitting jobs that are posted on job sites like Monster.com and Indeed.com. You can also advertise your services on Craigslist. If you love animals, offer your services as a dog walker or pet sitter. This is a great way to make extra money if you need encouragement to exercise. You’ll make some side money to reward yourself for taking a walk. Check out rover.com for opportunities. If you’re a native or fluent English speaker, you can teach English as a second language to students around the world. Some companies will require you to have a teaching background, but others will not. If you have a teaching background, it can be a great side hustle option for you. Check out VIPKid and QKIDS for available opportunities. Online Tutoring can be a great side hustle to make money if you have experience in a particular subject, such as math, English, history, etc. There are many tutoring websites and agencies online that hire online tutor to teach their clients, i.e. students. Sign up with a reputable online tutoring agency to land an online tutoring job. You will need to have a high-speed Internet connection and Skype account to tutor students online. Some of the reputable tutoring sites that offer tutoring jobs online include tutor.com, TutorVista.com, TutorZilla.com, and OKTutor.net. You can also tutor students at home. It’s a great side hustle you can start to earn extra money. Usability testing involves testing websites, apps, software, etc. and providing feedback on the user experience of these websites apps, software, etc. You may have to record your thoughts on a microphone or answer questions in writing at the end of the test, depending on the job. You will give feedback and usability ratings on websites, apps, software, etc. There are some sites that hire people from around the world to perform these user testing jobs. Upon successful completion of the job, you’ll be paid out a flat fee per job or test. It takes about 15-20 minutes to test a website and the pay is anywhere between $5 and $20, depending on the site offering the job. Check out User testing, WhatUsersDo, Userlytics, TryMyUI, an Userfeel to find usability testing jobs online. If you love to write and have a good amount of knowledge of a certain topic, you can start writing content online for companies and people to make money. If you have research skills, then you can write about many different topics and earn a lot more. There are many different ways to find freelance writing jobs online. Some of the best sites that you can check out include Freelancer, Upwork, PeoplePeHour, Guru, MediaBistro, ProBlogger Jobs, BloggingPro, iWriter, Textbroker, Online Writing Jobs, Scripted, Demand Media Studios, HireWriters, About.com, LoveToKnow, Wise Bread and wiseGeek. Freelance writing isn’t the only thing that you can do on a freelance basis. if you have a marketable skill in any other areas, such as sales, marketing, designing, programming, SEO, social media, or something else, you can find and freelance gigs online to make extra money. There are many freelance jobs available. The easiest way to get started is to register on freelance sites such as Freelancer, Upwork, PeoplePerHour, and Guru and start bidding for jobs that are posted by companies and individuals from around the world. You can also offer your services on Fiverr. Freelancing is one of my favorite ways to make money online. Use your current skills to make money with freelance gigs. Amazon Mechanical Turk (MTurk) is a micro-task site that lists a wide variety of Human Intelligence Tasks (HITs) for freelancers to complete. You can do random tasks like data entry, identifying objects in a photo or video, removing duplicate content from business listings, short online surveys, search engine evaluation, translation, transcription, website content writing, etc. to earn extra money. These tasks pay incredibly low amounts, but they take very little time to complete, so if you can do a many tasks as possible, your earnings can add up quickly. You can work as a virtual assistant to help small companies and people from around the world with administrative tasks that a traditional administrative or office assistant would complete in a regular office setting. Typical tasks include answering calls during business hours, handling outgoing calls, scheduling appointments, etc. However, virtual assistants can help clients complete a variety of tasks such as writing, editing, proofreading, programming, translation and transcription, depending on their skills and job requirements. Some well-known companies that hire for remote virtual assistant jobs are Worldwide101, Time Etc., Fancy Hands, Red Butler and Belay. Also, check out freelance sites like Freelancer, Upwork, PeoplePerHour, and Guru to find work and offer your services on Fiverr. If you’re an expert social media user, you can offer your social media management services to many companies. You can even offer services to people who aren’t active on social media. Many companies and individuals don’t have a social media presence yet and they will pay expert social media users to improve their social media status. They will also pay you to help launch their social media presence. Jobs can include managing different social media pages, posting social meia content on a variety of platforms, commenting, moderating comments, liking, pinning, and more. Are you currently working as an accountant or bookkeeper in your regular job? Then, you can also do a few hours online to make additional income working for small companies and sole entrepreneurs. If you have a relevant degree or qualification, then you check out sites like AccountingDepartment.com, Belay Solutions and Assurance Financial Management. If you have graphic design skills, you can start a side hustle to make money by working as a graphic designer. Graphic designers do jobs like website graphics, logo design or banner design. You can specialize in a particular field like logo design or can do a variety of jobs that are available, depending on your skills. Graphic design is an in-demand job. If you build a portfolio of your work to showcase to your potential clients, you can earn a decent side income as a graphic designer. Check out freelancing sites like Freelancer, Upwork, PeoplePerHour, etc., or offer your services via Fiverr. You can also find jobs on sites like Indeed.com, FlexJobs, 99design, and Designhill. You may have heard this term, but may not be quite sure what it is. Basically, a mystery shopper poses as a regular customer to evaluate the goods and services that a business provides. Check out mystery shopping companies like Bestmark for opportunities in your area. If you have a car, you can become an Uber or Lyft driver to start driving people around to make money. Sign up with both Uber and Lyft to maximize your earnings. If you are accepted, you will pick up passengers and deliver them to their destinations. A food delivery job can be a good side hustle if you have a car and some spare time. Sign up with Uber Eats to become a food delivery driver to deliver food from a wide range of restaurants to customers around your city. With Uber Eats, you’ll only deliver food to areas around your location. Amazon Flex drivers deliver packages for Amazon’s instant and one-day ordering services. As a driver for Amazon Flex, you’ll pick up packages from Amazon distribution centers and deliver them to customers at their homes or offices. As a driver, you will be able to choose routes and sign up for shifts each day. If you’r creative, then you can sell your creations on Etsy. You can sell anything like paper goods—e.g. cards and invitations, accessories like jewelry and knit scarves, and clothing. There are many different side hustles that you can do to make extra money and pay off your debt quicker. Start a side hustle or more, depending on your skills and schedule, to start to bring in extra income. Soon you will be able to get out of debt fast with a side hustle.